A fig tree is a most tenacious plant. I know this because until recently I was host to one in the little walled yard behind our house by the sea where we have lived (when not in Spitalfields) these past few years or so. It is our place of self-imposed exile. We inherited the tree fully-grown from the previous owner, and struggled to restrain this tyrannical and overbearing lodger. It grew at an astonishing pace. It greedily usurped all our outdoor space. Its spreading leaves cast everything in shadow. It threw out suckers like willow wands sprouting to every side. It made me think of that movie with the giant flesh-eating plant that grew and grew and called out "feed me!". To top it all, a local colony of green parrots and rowdy magpies ate its unripe fruit before we ever got the chance to collect it ourselves. I lost patience in the end and took to the thing one afternoon with a chainsaw. I was like a man possessed. I felled it heavily to the ground, and cut it up into small pieces like some crazed axe murderer. This big old fig tree took its revenge on me. There were roots as thick as footballers' thighs to grub up, and I wasn't through with this brute till dusk. Spitalfields too once had its celebrated fig tree, close to the run down old fruit and vegetable market in Brushfield Street. It seeded itself on a vacant rubbish-strewn corner lot where a fine old Georgian house and shop once stood. It might have been a German bomb in wartime that spared the developer or city planner his heartless task of flattening the old place. Property values have soared in this road, like all over London I guess. Every inch now is treasured and built up and over-developed, and wrung out dry for each last penny of profit. An Israeli falafel joint now trades there under a featureless block of flats. Princelet and Wilkes streets likewise are adorned with pastiche Georgian houses recently erected on vacant lots, probably WWII bomb sites. What was once buddleia-infested unloved habitat for urban wildlife has been transformed overnight into fashionable real estate. These replica houses boast fancy price tags every bit as steep as their more authentic period neighbours. It is amusing to contemplate the circumstances of this tree's beginnings. Did some market porter, munching on ripe figs on his way back to the station, after the long night shift, toss one over his shoulder onto the waste plot? Was the seed carried by some old scavenging pigeon? In any case, the tree achieved a certain celebrity in our neighbourhood for a time: a cause celebre. People sought its protection - they wanted it listed, as a kind of memorial to the old market. The developer was stony-hearted, needless to say. But none mourned the fig tree so much as the Bangladeshi ladies, who came each year in little clusters from around Brick Lane, in their bright, primary-coloured, pavement-touching sarees, boldly and brazenly you might say, to pick the barely-ripe fruit from the laden branches. They carried it away bundled in cloth and used it to make chutneys as condiments for curries. You have to admire their enterprising spirit of self-reliance. Has anyone contemplated writing nature notes - field notes - to our neighbourhood I wonder? What would Richard Jefferies, our great prose-poet of the English countryside, make of this plot? Not much, I suppose. He would be amused to see the ducks paddling about on the modern water feature in Bishops Square, apparently oblivious of the crowds of people devouring their lunchtime sandwiches. This corporate landscaping of a shared public space was designed to soften the impact of the cruelly bleak Allen and Overy building behind it. But it is something of a missed opportunity. We bent the ear of "Woody", the esteemed landscape architect for the scheme, during a day-long consultation with neighbours and architects. We waxed eloquent with our harebrained schemes and profoundly impractical ideas. We wanted the Tuileries Gardens in Spitalfields. The architects talked of basement height levels, fire brigade access and health and safety. We were listened to in respectful silence. I felt sorry for the guy, for being given such a demanding brief. He was being told to engage all our senses, to make the space sing. We got hedges and lawns and shrubs and trees in addition to the pretty pond with water lilies and the obligatory display of contemporary art. But the trees were somehow wrong. Their sinuous limbs, and unfamiliar foliage and fruit immediately declared their foreignness. Woody had planted non-natives, Japanese it is presumed, to give us a year-round display of the odd and esoteric. It is extraordinary I suppose that anyone should be affected by so small, so trivial, a planning detail. And yet it seems to make the thing for me an exercise in alienation - could that be what is intended? In any case, it puts me right off the place. There is perhaps an unexpected rich vein of nature running here in Spitalfields, and I don’t just mean what is disgorged by Liverpool Street tube station on the weekends. Consider the foxes lair just yards from Carluccio’s, and directly under the noses of the estate management security. How cocky and unfazed are these beautiful creatures, as they insolently inspect the passers-by. After dark their eyes shine like diamonds in the shadowy places at the edge of the market. A bi-product of the demolitions of disused buildings is the loss of habitat to birds and animals. “Black redstart”, the young birder called out to us one morning from the street, pointing and looking up to the roof of the old night shelter building on Crispin Street. This magnificent pile was about to come down at the time, apparently without any murmur or whisper of criticism or revolt in disputatious Spitalfields - how did that happen? Behind the retained facade, ready-made student rooms would be lowered by cranes and fitted together like toy blocks to house LSE postgrads. He well knew the bird’s lovely call - it quite stopped him in his tracks. We had watched the nesting pair - incredibly rare in England, they had crossed continents to get here - who apparently liked the craggy isolated nooks of this abandoned urban landscape. 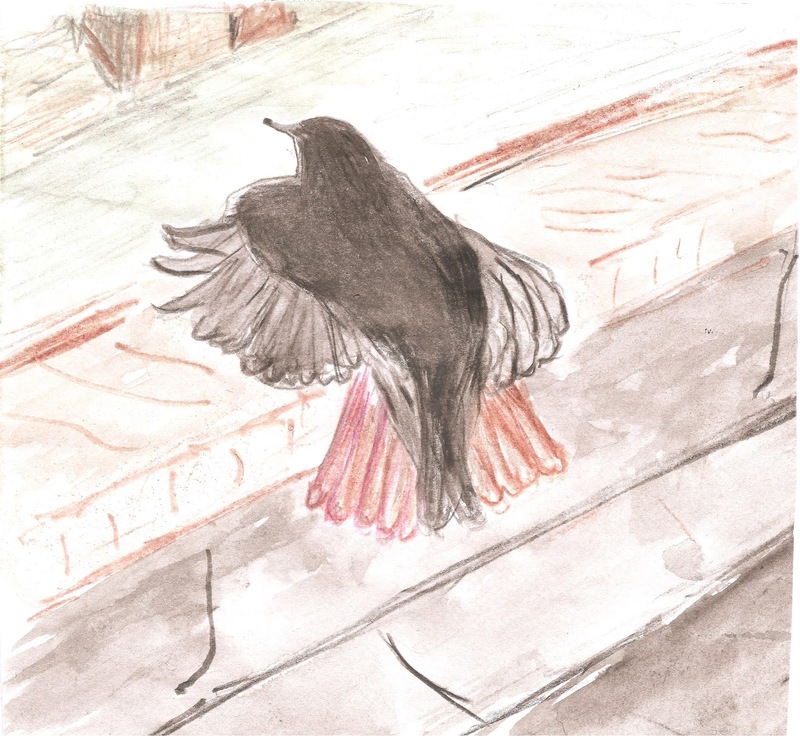 The male has an entrancing way of fanning out his filmy black wings and tawny tail and suspending, momentarily, all forward movement. He will never alight on his perch without first performing this little dance in the air. We identified a bit with those redstarts. We wondered how they would manage when everything was soon swept away. “Spitalfields rocks” we used to say, of its trendiness. Now we mean something quite different. When a building comes down across the road from where you live you get an interesting new view, at least temporarily, of what lies behind. You may catch yourself staring at this for quite some time. Unaccustomed sunlight comes flooding into rooms normally cast in shadow. And how strange it is to see a section all the way through, a clean cut, with tiled walls, staircases, chimneys, sitting rooms and bedrooms all open. It is poignant to discover that many of the buildings we have cherished and admired year after year, some of them old and historic, may turn out to be more valuable to society - or at any rate to developers - as putative piles of dust to make way for the innovations of modernity. The owners of the Wellington Arms, in Brune Street, for example, must have felt like they’d won the euro lottery when their site was slated for yet another Spitalfields mega-development, complete with multi-story tower blocks vanishing up into the clouds. The payoff was eye-watering, and there have been others since. The temptation to sell up must be huge. It certainly beats pulling pints at the bar day after day and the monotonous routine of a desultory lunchtime trade. The revolving door which is corporate Spitalfields has been spinning frenziedly ever since the old market changed hands and went into ownership from America. New investment is of course a very good thing but it has been a bumpy ride in the market. One recent disappearance is the upmarket Swedish sandwich place that replaced the traders’ favourite Daily Grind in Brushfield Street. How long did that new place last - about five minutes? Turn your head and it’s gone. The ‘Grind’ hung on for many a long year, and was the nearest thing Spitalfields had to an informal cafe, after the disappearance of Dino’s in Commercial Street and, before that, the Market Cafe in Fournier Street, Gilbert and George’s old breakfast haunt. I guess you have to eat out if you don’t have a kitchen. High rents presumably caused its demise, just as they did for Los Barriles, the famous Spanish tapas restaurant, over on the other side of the market. I still hear people talking fondly about that place. It was a highly successful long-established family business but when the new owners reviewed the rent they handed back the keys. Noncorporate Spitalfields, or what remains of it, looks to be in better shape perhaps, and definitely needs to be celebrated and supported. A. Gold, in Brushfield Street, after all these years, is still faring well in Paulo’s tender care. You can’t get a better warm roast leg of lamb sandwich anywhere that I know. Everything is cooked fresh on the premises with great flare. Phil has stepped back a little there, but is still doing creative web design. Their business first got going about fifteen years earlier when Philip's old school chum Ian Thomas and wife Safia Shah created their English delicatessen - a wonderful cornucopia of British specialities in traditional food and drink culture, with evocative products like dandelion and burdock, English mead, Campbell's tea, Cumbrian fudge and London honey. To pause a moment among the groaning wood racks stacked high to the ceiling is to take a swoonmaking, sentimental tour of the British Isles - not to be missed. Harvey’s shop just next door, Verde, equally looks fabulous and is pulling in great numbers of adherents to old Spitalfields. When, some twenty years ago, Merchant Ivory wanted it for a set for one of Henry James’s novels they hardly needed to dress it. It served as the curious little Bloomsbury antique shop which lured in Charlotte Stant and Amerigo in The Golden Bowl. In the silk purses from sows’ ears category we need to congratulate Ottolenghi which finally opened recently after an interminable building refurbishment project and, it must be said, now looks stunning. This is in Artillery Passage, in place of the old Eat and Drink Restaurant. I don’t think many can mourn that old boozy city speakeasy. Surely there never was a more unauthentic Chinese restaurant. It was mainly noted for its karaoke parties, and for upsetting neighbours with noise nuisance late at night. Ottolenghi’s white temple to contemporary food style certainly rings the changes for Spitalfields. It is all refinement and glamour and seems to pull in a great many visitors from outside the neighbourhood.